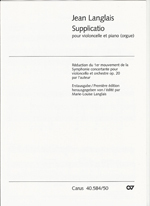 Diptyque Symphonique Sacré for Organ and Orchestra, first publication. 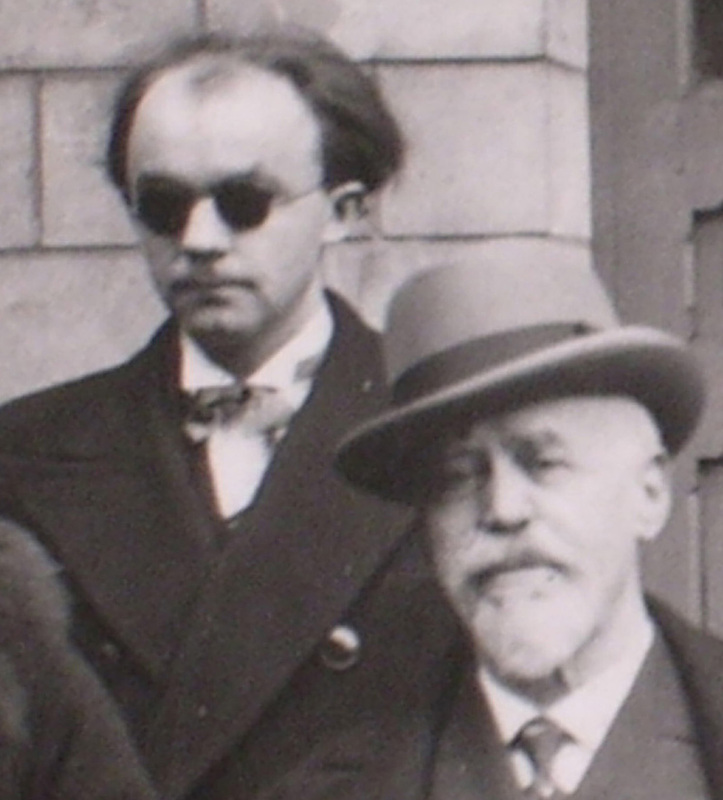 Jean Langlais entered the Paris Conservatoire Composition class of Paul Dukas in 1934. 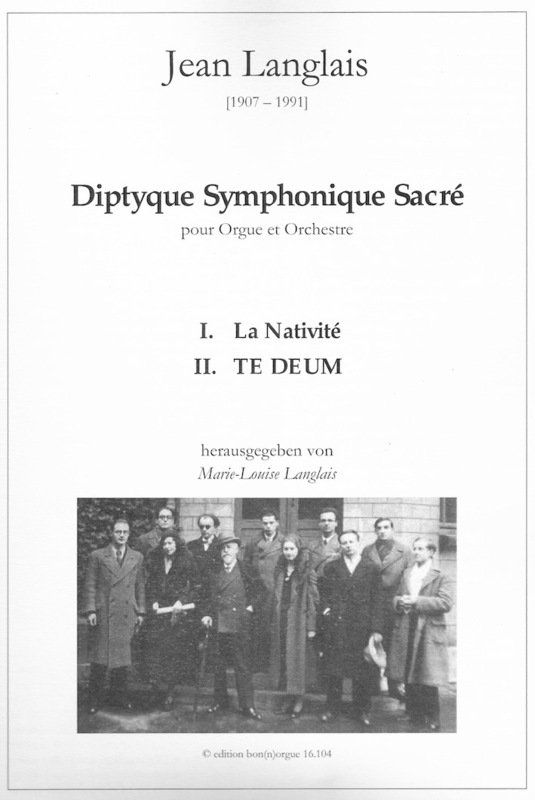 Under his direction he orchestrated 2 of his organ works, "La Nativité" (Poèmes Evangéliques) and "Te Deum" (Trois Paraphrases Grégoriennes) for organ and orchestra. 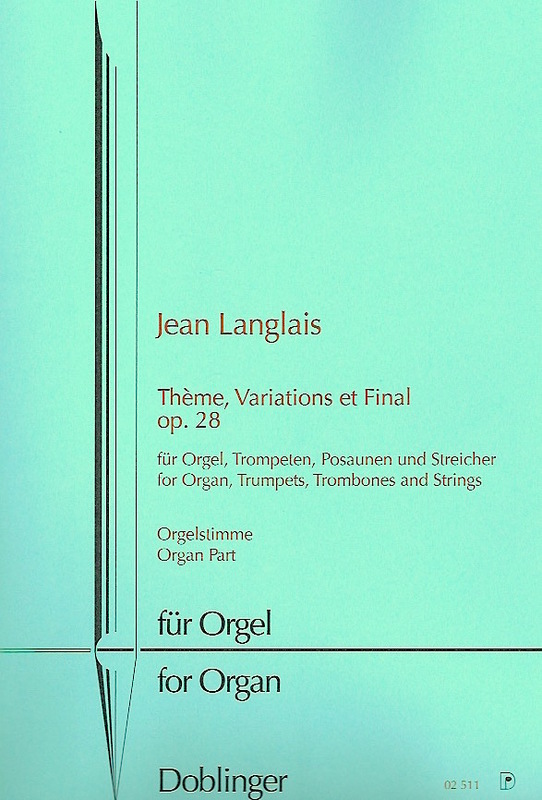 These famous pieces for organ are now published, in 2016, for the first time, in the organ and orchestra version, by edtiions Bon(n)orgue, in Germany, at the occasion of the 25th anniversary of the death of Jean Langlais. Playing time: ca. 10 min. 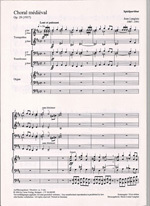 Hymn for Choir, Soprano solo and Orchestra, first publication. 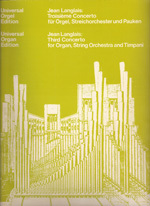 "La Voix du Vent", op.11, Hymn for mixed choir, Soprano solo and Orchestra, was Jean Langlais' first orchestral work composed in February-March 1934 on a poem by G. Carimalo. 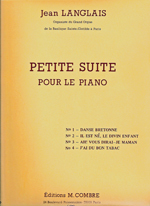 This work, composed in 1937 for the"Amis de l'Orgue" composition competition, won the "First Mention à l'unanimité", the only award distributed. 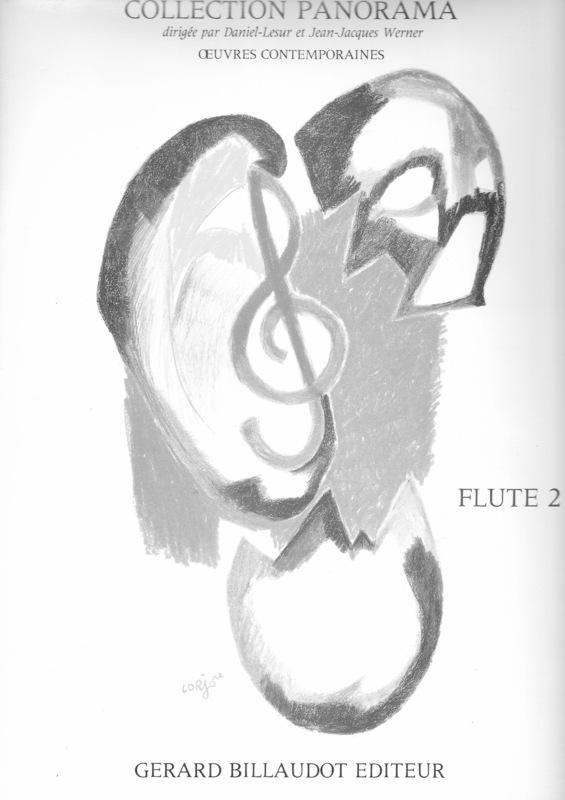 It is a Theme with variations for organ and strings concluded by a monumental Fugato where trumpets and trombones appear suddenly. 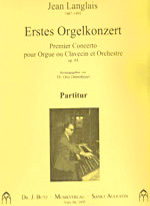 The organ solo part is on sale at Doblinger (n°02511 of the catalogue) and the performance materials are available on hire. 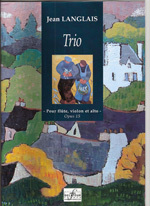 Published in 2007, for the centenary of Jean Langlais, first edition of this trio for flute, violon and alto composed in 1935 at the Paul Dukas composition class. Playing time : ca.3 min. Duration : ca. 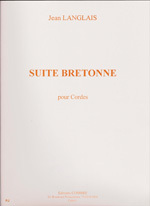 20 mn. 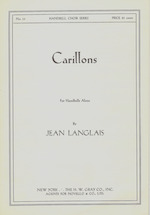 On the occasion of the 20th anniversary of Jean Langlais' death in 2011, Carus publishes for the first time an arrangement for cello and piano or organ found in the composer's archives of the first movement of Jean Langlais "Symphonie concertante pour violoncelle et orchestre" written in 1936 and published by Carus in 1999.The title "Supplicatio" has been chosen especially for this first publication of this arrangement.. 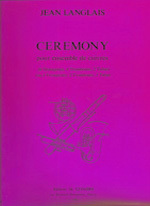 Duration : circa 4 min. Playing time : ca. 3 min. 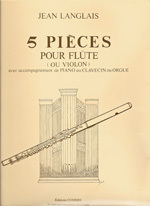 Score and performance material sold. 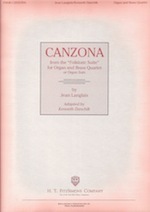 In 2003, organist Kenneth Danchik adapted for organ and Brass Quartet "Canzona" from Jean LANGLAIS "Folkloric Suite" published in 1954 by FitzSimons. 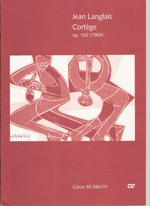 Exclusively distributed by Hal Leonard. 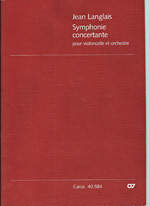 The first movment of this concerto is the "Thème, variations et final" for strings and organ, composed in 1937 for the composition competition "Prix des Amis de l'Orgue". 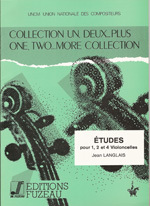 Langlais won the 2nd Prize (no first given). 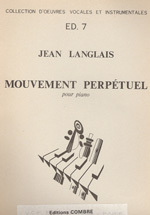 Second movment is a brief interlude for organ solo, and the third one is a "Final" for strings and organ which includes "Plainte" (Suite Brève) in an orchestration for strings and organ. 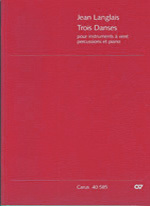 Organ solo score sold, performance material rental only. Playing time : ca. 29 min. 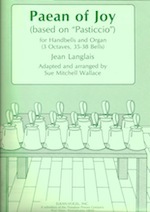 This work, composed in 1968 for handbells, was first published by H.W. Gray. 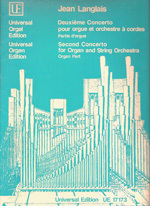 Permanently out of print, as are two other versions of this work (for 37 bells and for 53 bells, 3 and 5 octaves) also published by Gray, arranged by Glenn Shields Daun, also out of print. 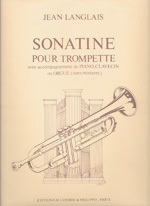 Cortège for 2 organs, 4 trumpets, 4 trombones, tympanies ad lib. 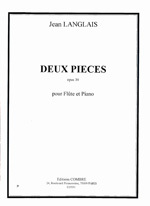 Organ solo part and performance part sold, performance material rental only. 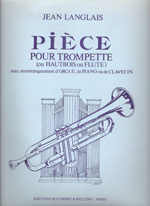 Playing time : ca.16 min. Playing time : ca. 13 min. Playing time : ca. 6 min.